The Latest with David Jay: Thank You! A week ago Kevin Meyers wrote and said he was gonna be in Orange County for the weekend and wanted to have dinner with Jasmine De La Torre and me. So last night when I rolled in and there were like 20 people I was blown away...and kinda confused. 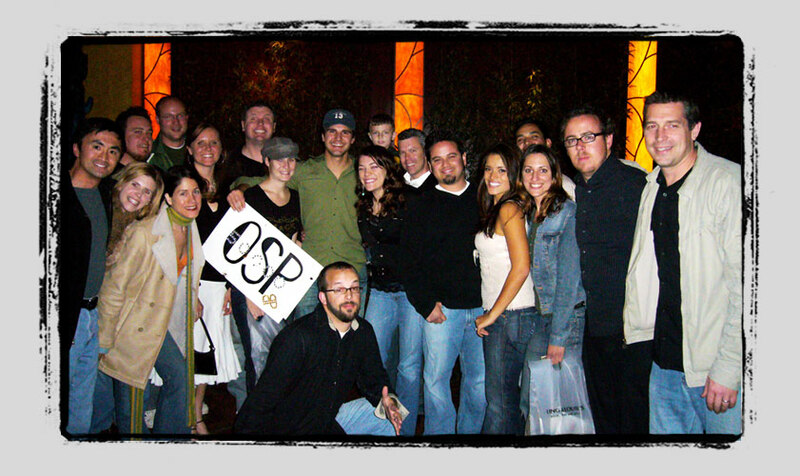 :) I came to find out that they had thrown this surprise OSP party for me because OSP reached 50,000 posts! How awesome is that! It's really amazing to be a part of this group of people and to see them show so much love and care for their friends and colleagues. I hear stories of hope and success from people every single day about how the encouragement they've received from their friends on OSP has allowed them to live their dream. I can't even begin to express my thanks to all of you on OSP. As I've said many times before - this place is yours...and thank you for what you've made it. The reason it has gotten so big is because you have created an environment where people can be who they are, an environment where people can be appreciated not only for what they've accomplished, but for who they are becoming. You've created an environment where people are human again and all of you realize that your words can hurt or heal so you take the time to make sure your posts express humility and knowledge and that your conflicts are handled with civility and respect. All of you are my heros - my friends - and you're the future of this industry. That's sooo awesome!! Congrats DJ on #50,000... (and Jim too for upping the ante! haha). I'm soooooooooo jealous I don't live closer :( What fun! "A leader leads by example, whether he intends to or not." DJ you have such great energy and so all of this attention is because you are a GREAT guy and you have so much to offer this industry! You are only at the beginning of an incredible career! I am so happy for O.S.P. and congratulations!!! You're the bestest DJ...we all love you and whether you'll take credit for it or not, OSP wouldn't be where it is today without your vision! Yeah DJ you are great... such a well rounded person... you have so much to offer so many of us. Your style is perfect... the way you handle yourself and your business is very admirable. We are sad we couldn't be there for your party... just know that we are excited for you. Hey DJ! After what the Fonginator said, I'm excited to see where you end up...if you ever "end up" somewhere. My guess is you'll just keep on reaching new heights!